Thomas Fire: New Evacuations In Southern California, Coastal Areas Threatened : The Two-Way The Thomas Fire has raged for nearly two weeks and on Saturday, new evacuation orders were issued in Santa Barbara County. A local zoo was preparing to move some of its animals out of the danger zone. 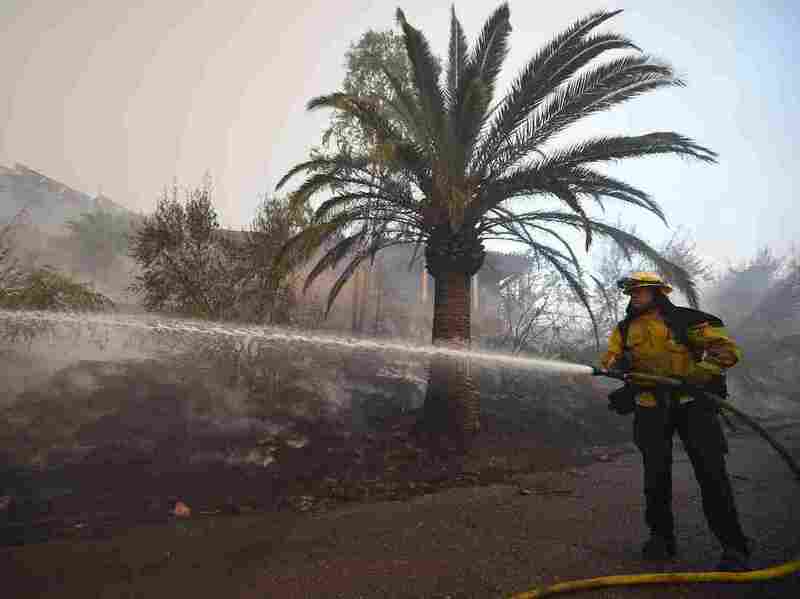 A firefighter douses flames around a house that was saved while the property around it burned as winds picked up and pushed the fire west Saturday in Montecito, Calif. The wildfire, which has burned 259,000 acres and destroyed more than 1,000 structures, is considered the third-largest in state history. Officials said about 18,000 homes and other buildings are threatened by the blaze, which is only 40 percent contained. "Though the Santa Ana winds died down a bit overnight, the National Weather Service is forecasting winds will pick up this weekend," Jeanine Herbst reports for NPR's Newscast unit. The winds are driving the fire toward wealthy communities in the coastal mountains northwest of Los Angeles, member station KPCC reported. One of those communities, Montecito, is home to Oprah Winfrey and other celebrities and it is among the areas in Santa Barbara County that were ordered evacuated on Saturday. As the fire approached Saturday morning, Montecito resident Darren Ceasar was preparing to flee his home. "Look at how many firefighting assets they have. I know what they're doing. I trust that they can do everything they can to protect the structures," he told the Los Angeles Times. "But it's the wind. Nobody can fight the wind." "When the [winds] surface in that area and the fire starts running down slopes, you are not going to stop it," Mark Brown of the California Department of Forestry and Fire Protection told reporters. "And we are not going to stand in front of it and put firefighters in untenable situations." Thousands of firefighters are working to control the fire. One firefighter was killed earlier this week. The Santa Barbara Zoo is located within a voluntary evacuation zone. "Some animals are going into crates and being staged for possible evacuation to predetermined locations," the zoo tweeted Saturday morning. "Staff has training and transportation. We DO NOT need public assistance. Do not come to the Zoo. Stay safe." Later in the day, zoo officials said the only animals moved so far were endangered California condors and griffon vultures which went to the Los Angeles Zoo and reindeer that were moved to local showgrounds.